The Horror Section: When Will They Ever Learn? Okay! With all that weekend business out of the way, it's time to get into what I've been catching at TIFF. 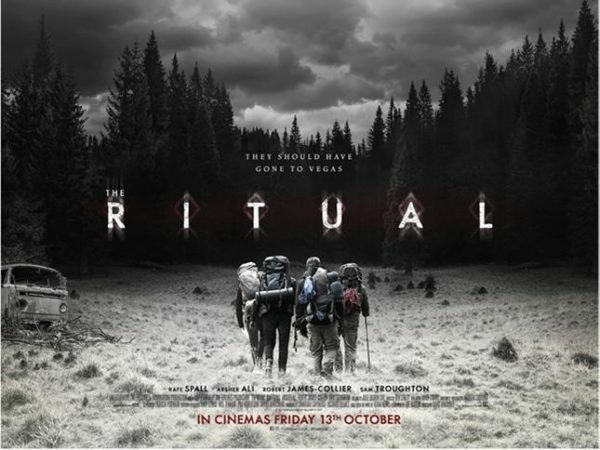 My inaugural film this year was David Bruckner's debut feature, The Ritual. 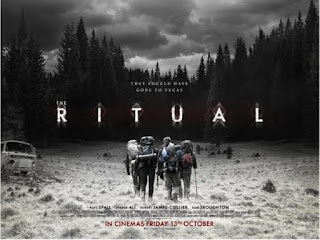 Based on the novel by Adam Nevill, The Ritual tells of four friends who while hiking across Sweden get lost in the forest and find themselves being hunted by a malevolent entity. Over the last decade, Bruckner has done some solid work in the anthology format (his contributions to The Signal, V/H/S & Southbound were both among the best) so I was stoked to see what he could do with a full feature. I think he transitioned well. The Ritual succeeded for a few reasons, not the least of which was the characters – or more specifically the characterization. This was a great ensemble that consisted of Rafe Spall, Robert James-Collier, Arsher Ali & Sam Troughton. Admittedly, Spall carried most of the weight, but this foursome really worked well together. I believed they were friends, even if it was evident from the get-go they were growing apart. I could even buy they would decide to take that inadvisable shortcut. I was actually reminded of an indie I saw a few years ago called White Raven. That ensemble had a similar camaraderie with dialogue that also rang true in a deeply sincere way. 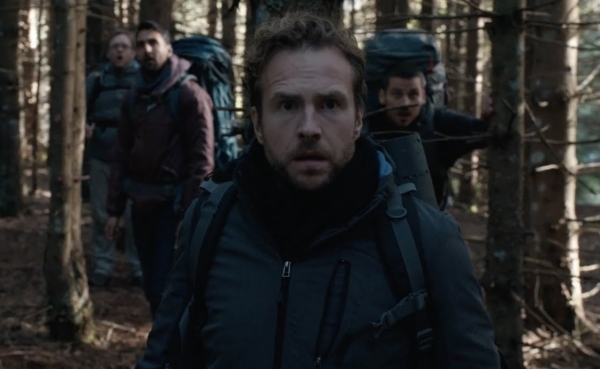 Rafe Spall & friends in The Ritual. This film also featured some stunning cinematography by Andrew Shulkind. The Ritual was set in Sweden, but actually shot in Romania and they have some really scary trees over there. I'm used to seeing North American foliage in movies and these trees had a denser, more serrated textures that was way more off-putting. I also really liked the visual representations of the nightmares experienced by Spall's character. The way they were mixed in with the forest environment was really interesting stylistically. As I said before, this was based on a book, which I have read (surprise!). There were some changes made, but honestly most of them worked in the movie's favour. Most of the opening act was not in the book, but it didn't feel superfluous and really informed the characters motivations and what invariably led to the boiling point. The story itself was fairly simple and yet I was never bored, even though it was largely just four dudes lost in the forest. Again, I attribute that to the performances and Bruckner's balanced narrative. I think the only change from the book that was questionable was the nature of the antagonists. Bruckner opted to go with something a little more generic, likely in the interest that it was either easier to explain and/or portray onscreen. I think the source material was a bit more unique and energetic in this case. However, the real highlight of the film was the big bad who finally comes out from behind the trees during the climax. I loved the design of this thing and though they may have shown it a bit too much, there was no denying there were some terrific shots that really stuck with me. 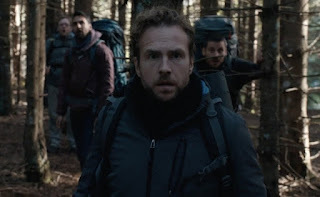 So while The Ritual may be a bit too oft-travelled material to be considered a home-run, it was a quality genre flick with performances that rung true and visuals that resonate. A worthy trek if you ask me.